The gift came in an unrecognizable blue binder. My sister-in-law and brother were gleaming with the excitement of gifting. But I didn't hide my amazement. Scuba lessons? I have always been luke-warm to marine biology. I owned an aquarium in graduate school and the fish I called Depeche Mode ate the fish I called P.M.Dawn. On my first trip to the Maldives, I just swam recreational and on the second trip, I snorkeled with friends because they encouraged me. This was more encouragement than I ever needed. 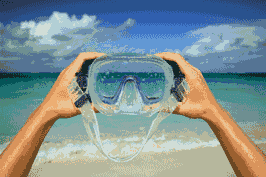 A course in scuba diving, with its mandatory theory. It was gifted with a persuasive label: "quality time with your younger brother". I am a sucker for the marketing tool "quality time" and a total adept of "package paid, classes attended." Didn't I buy the all you can bikram introductory package of 10 classes in 10 days in a row and attended 8 of them? But yesterday, I was thinking of my friend who, in search of quality time with me, bought a package of 8 golf classes and only attended one. I thought of barging out of the class where they were teaching us, weird calculator in hand, how much dive time, we had at what depth. They had scared me enough with all the risks and dangers of diving. If someone is negligent, it is me. If someone needs repetitive instructions, it is me. Why am I doing this? Walk out and the only danger is being branded as a "spoiled brat who couldn't appreciate her gift." 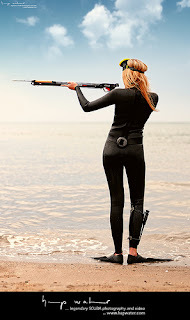 Besides I looked at the diving crew, their equipment and wondered: do I want to belong to this world? It is analogous to the equestrian world: people who live with horses day in and out, in their jodhpurs, carrying saddles and grooming their horses. I got into my wet suit, thinking of all the 007 girls who had worn them, lifted the equipment, dove into the pool, got very confused with all the tubes hanging from the BCD. I watched as the instructors made sign language, got my mask fogged up and refused to take it off lest they fail me. I remembered the ballet classes my mom forced me to attend, the physics labs I day dreamed through, the Islamic history seminar I took with a professor I disliked and I realized then that I was here against my will! Sometimes the best things that can happen to you are against your will. Trust me. I have always had a love hate relationship with the sea and one day decided to conquer my fear...with extreme encouragement by our mutual aunt. Nine years ago I got my PADI license and have never looked back. It is an incredible journey to go underwater. You, my dear cousin, will become addicted in no time. Don't worry about everything they teach you. Whenever you go, you are going to go with a Dive Master who will tell you when to surface, etc. Also, did you know you can burn between 200 and 400 calories a dive? Something tells me you're going to be scuba diving in your bath tub with that bit of information that I just gave you. AND, most importantly, it is the one thing that you and I can have in common and enjoy together so in the words of Nike...Just Do It! My husband had his first scuba diving experience on our honeymoon and today he is the proud holder of an Open Water PADI. Scuba isnt fun when you are taking theory classes and diving into a pool but there is something magical, almost holy about being in crystal clear waters in a world you could never visit without your scuba gear. I still remember the first time I was able to breathe under water for so long, and yes it was a great feeling like something you would have always wanted to do as a child. I would say stick with it, give it a chance and maybe we can all head out to fujeirah one weekend. Good luck with your gift. It is funny how the blogger tried to lure me to get into golfing.She gifted me free lessons for my birthday,but as the saying goes:you cannot teach an old dog new tricks.Whether it is skiing,horseback riding or golf,you need patience,youth and determination which I unfortunately lack at this stage in my life.I am so glad that my children and theirs have been"criminally" exposed to so many activities,and have the luxury to choose whatever they like at a younger stage in their lives. Thank you for sharing this mind blowing post with us!